For the early risers among you, there’s an unmistakable planetary visitor currently gracing the dawn sky. Having passed inferior conjunction between Earth and the Sun on 26 October, Venus moved into the morning sky and has spent the intervening time slowing drawing away from the solar glare. 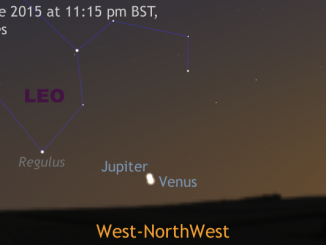 Presently the brightest object in the dawn sky, magnitude -4.5 Venus rises more than two hours before the Sun for observers in the British Isles and may be found in the constellation Virgo low in the southeast an hour before sunrise (hint: you can use our interactive online Almanac to calculate local times of events). If you look carefully before the twilight grows too bright, you may spot that the planet has company. 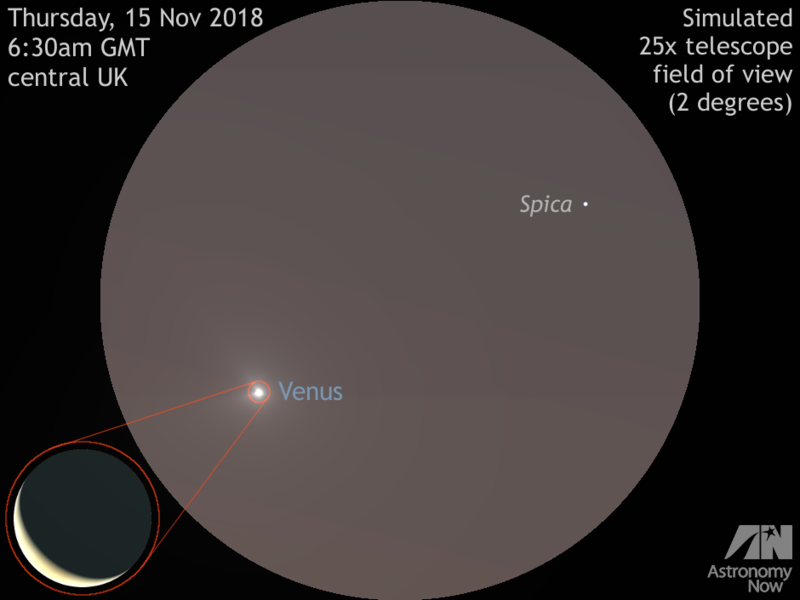 On the UK morning of Thursday, 15 November 2018 around 6:30am GMT, Venus lies just 1¼ degrees from first-magnitude star Spica, Virgo’s principal luminary. Viewed through a telescope at this time, Venus appears as an 11 percent illuminated crescent exceeding 52 arcseconds in diameter and lies 47.8 million kilometres (29.7 million miles) from Earth. Owing to the planet’s large angular size this week, a typical 10x binocular is sufficient to glimpse Venus’ crescent. What’s the minimum optical aid with which you can see it? Tip: it helps to lean one’s elbows on a low fence or fall to steady the view. Note that between now and dawn on 20 November, Venus lies 2 degrees or less from Spica, so be sure to make the most of any early morning viewing opportunities. Planet Venus — the brilliant lantern hanging over the west-northwest horizon at dusk — reaches its greatest elongation from the Sun on June 6th. It’s still a month away from reaching peak brightness, but before then it has a spectacular close conjunction with largest planet Jupiter at the end of June. 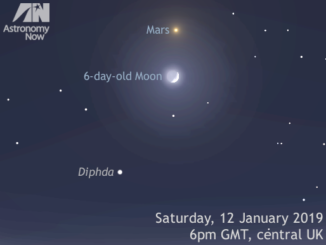 Before sunrise on Thursday 19 January, observers in Western Europe can see an interesting celestial conjunction in the southern sky. 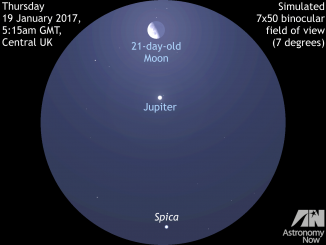 At about 6am local time, the waning gibbous Moon, largest planet Jupiter and Spica — the brightest star in the constellation of Virgo — all lie in a line encompassed by the field of view of a typical 7x or 8x binocular.